My friends the Schlegtonsterns held a Rite of Spring Party yesterday, which I attended as a Satyr. My photoset is available here, and I will post some making-of instructions for the Satyr costume soon. Are you sure it was a costume party? I only counted two dressed up. Anyways…Lee and I giggled when we saw the picture. So were you in character for the evening? 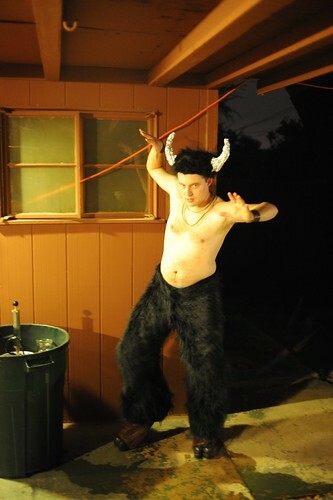 I looked up Satyr…something about a lecherous goat man?